Many of our clients ask us how they can produce a rendered picture from CDS to present to there clients. CDS does has a 3D option in which you can view your job in 3D. However it is of more use as a visual check of our data rather than a presentation quality output suitable to give to a client. In the past we have suggested the full version of Autocad as well as Renderman. Both these should be able to render dwg files created that contain 3D faces (ie triangles) as well as relevant strings etc. These high end packages should be able to use texture maps etc. The problem with this option is mainly the cost of acquiring the software. We hope to eventually integrate this option into CDS. However at present it is not yet done. We suggest the following method at present as a low cost output solution. We have been playing in-house with a package called Terragen. It is available as a free download from http://www.planetside.co.uk . This allows you to download the software and use for your personnel enjoyment. For commercial applications (eg you show your clients or use in reports) requires you to register the software for US$99. It's weakness is that it uses a grid layout. This means that fine edges can often appear jagged. This means it is unsuitable for road rendering. We are looking for alternatives that can overcome this weakness. In this tutorial we are going to show you how you can contour a job in CDS; and then export this file into Terragen so that you can show your clients. Your client has presented you with some data which has been picked up from his Island. He wants a contour plan, a height banded plan as well as a photo quality rendered picture he can hang on his wall. We have already imported the job into CDS and have a database to work upon. 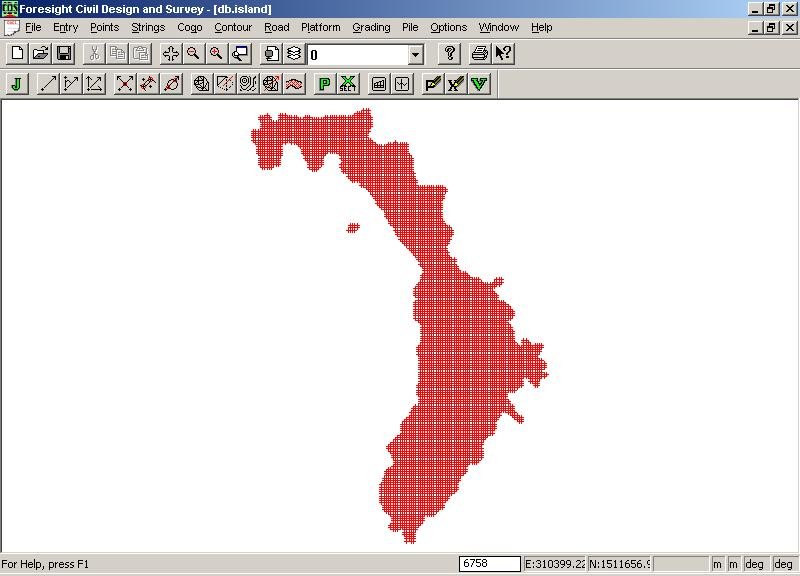 To download a copy of the data please point your web browser to ftp//ftp.foresoft.com and down load the file "island.cab" and place it into your data directory. To open the job open CDS and select the "Options" menu and then "Restore job". Browse to the "island.cab" file and select a destination directory. Then from "File" menu select "open" and open the island job which will be found in the directory you specified. The screen will display as follows. As you can see we have about 5000 points that define this Island. Also note that the points are regularly spaced about 50 metres apart. Our first brief was to create a contoured surface. 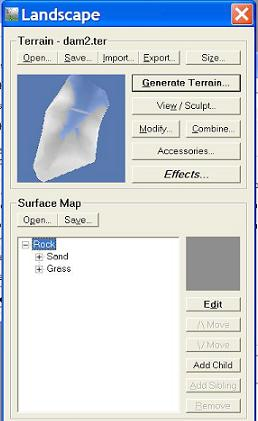 From the contour menu select surface parameters. 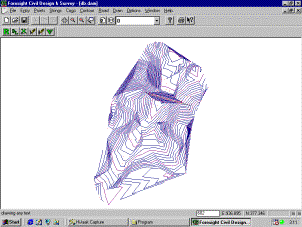 CDS has automatically set up the appropriate contour parameters including points to use. To limit the creation of triangles across bays etc we have also set a maximum triangle size of 100 metres. In this job this is very valid as all the points are within 50 metres of each other. We have also changed the major and minor contour intervals to be 50 and 10 metres. The default 5 and 1 metre intervals are too close together for this job.From the contour menu select create triangles and then select the create contour option. The display is seen at left. A quick glance shows that the north of the Island is fairly rocky. The center is relatively flat while the southern end is relatively mountainous. Our client has also asked for a color coded map as a visual guide to the height of the Island. This shows at a glance the relative height's around the Island.As an experienced surveyor you can see from the contour plan which parts of the Island you can take your Granny for a walk and which parts needs climbing gear. Your client however wants something a bit more visual however; and also something that he can hang on the wall. They have documented an input format so that we can actually get our own terrain into the package. The first entry refers to an "Oversize factor". This adds in data to the edge of the job ; so that our model does not appear to be floating in space.The "Edge Height" fills in this edge data with the height specified. In this case our Island is lapped via the ocean so a value of 0.0 is ideal. 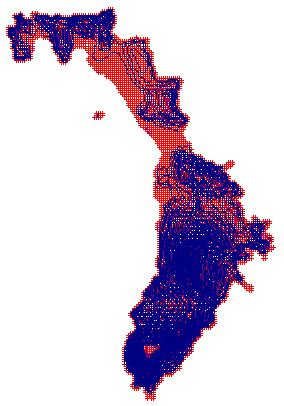 The number of grid points is the number of grids exported. Obviously the higher the value the more points exported; and the higher the resolution at the expense of rendering speed. We suggest a lower number first and then build up to your higher resolution. 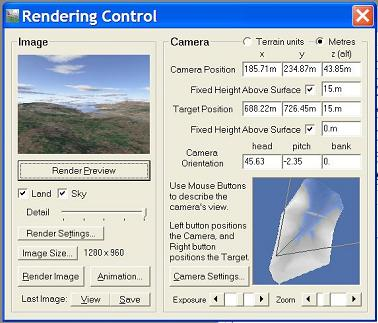 Clicking OK creates the Terragen input data. If you use the default values you will need to wait about 60 seconds; so please be patient while CDS interpoates the 160000 grid heights. Please note this following information is to help you extend the usefulness of CDS. We do not write or support Terragen. If you have any questions we suggest you refer to there web site; view there tutorials and participate in there user forum's. 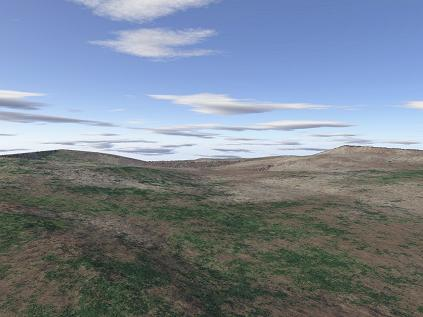 Open up Terragen and you will be presented with the following screen. There are two dialog's present. 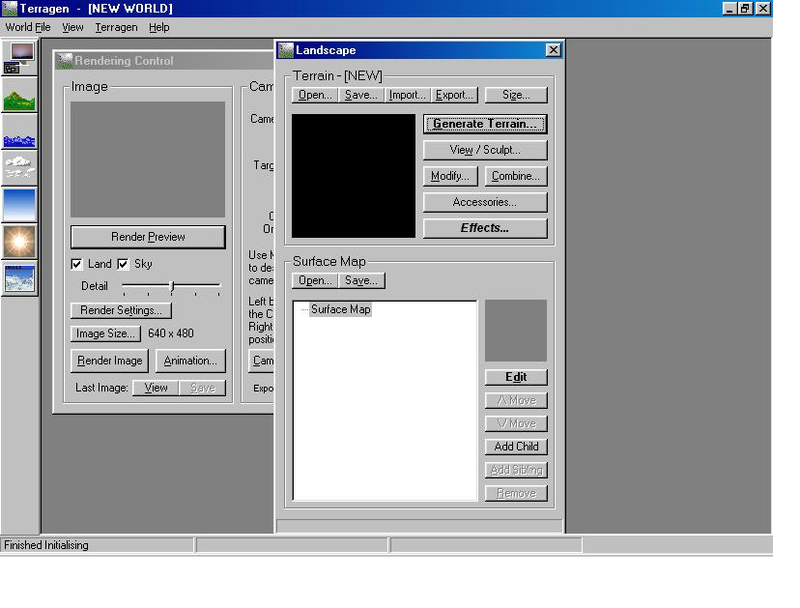 The Landscape / Terrain control as well as the "Rendering" control. We first need to import our data. From the Rendering Control select "Open" and browse to our exported file "island.ter". Select the file. The height map will display a black and white view of our data within the "Landscape" dialog. The higher mountain ranges can be seen in white. The area's close to height 0.0 are shown in black. First thing for this job is to represent the ocean. We have decided to display as water everything below a value of 0.1 meters. To do this select the water icon on the left menu and put in a value of 0.1 Hit the "update map" button to update the display. Our small height map is now displayed as. Without going any further we are now in a position to create our first render. Click into the "Rendering" control to make it active. Our first job is to set the position of our camera and the position of where we are viewing to. This is done in the camera settings view. To move the view position hold the left mouse down and move it. To select the target hold down the right mouse and move it. We have decided to initially view the bottom end of the Island. The camera position can be seen in the view above as the 3 intersecting lines. The outer lines represent the edges of the view. We have also set the view position to be 30 metres high. About the deck height of a cruise liner. To view a large image please click on this link. As a first attempt we are pretty close to the mark. On this part of the Island the rock is more of a brown color. Also the sea is rather flat for the open ocean. We should also render some of the flatter area's green to represent grass. To show how we can enhance the drawing we are now going to concentrate on another tutorial example. We are going to revisit the Dam example that CDS has used to demonstrate the use of the road works functions in the design of a dam wall. We suggest that you browse this tutorial now; so that you have an idea of the design procedure and how we have created our final finished surface and hence our final rendering. 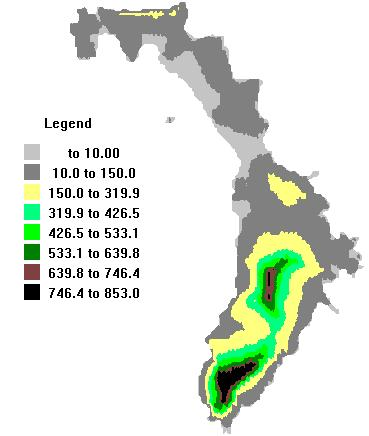 To refresh your memory we have some raw data that represents a creek valley where we wish to design our dam. We then entered two points on both sides of the valley which form the centre-line of our new dam wall. From here we calculated some profiles and sections along the raw data. We then defined a new design line which represented the top of the dam wall. From here we designed a template that consisted of a flat top and a dam wall with a slope of 50%. From here we ran the road routine to put these calculated design points back into the database. These points have design heights. We then triangulated and contoured this surface to check that our dam wall appears correct. We then created a new surface which we defined as a combined surface. Merging surface 1 as the base and surface 2 as the design leads to a new surface 3 which we have triangulated and contoured as a finished surface. The data can be downloaded from ftp//ftp.foresoft.com and download the file "FinishedDam.cab" file. As before to bring this into CDS do this. Open CDS and go straight to the "Options" menu. Run the restore option. Go to the "File" menu and then run open and browse to the "db.FinishedDam" file. The data will appear as shown above. As before we wish to display a rendered view in Tarragen. 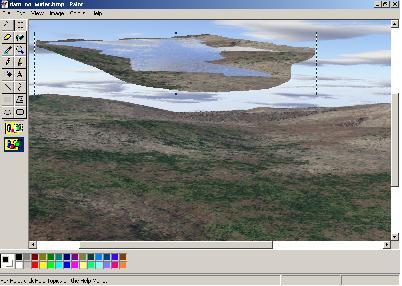 From the CDS "File" menu select export and select the "Terragen" export. 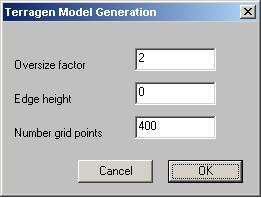 In the Terragen export dialog I used an oversize factor of 1.0 (no overlaps); an edge height value of 164 (equal to lowest height in the job) and left the number of grid points at 400. This value appeared fine; however if you are looking for close-ups of the design wall then a larger value would make the dam wall less jagged. Please wait while the Terragen export file is created. Now run the Terragen program. Make the Landscape dialog active. We now need to open up the ter file that represents the finished dam surface. Click on the "Open" button under Terrain and browse to the file that we have just created.In this example we are going to be a bit smarter in relation to vegetation and color etc. We are going to use a surface map to better define the rendered surface. Under surface map you can see the "Open" function. We are going to use one of the predefined surface maps. 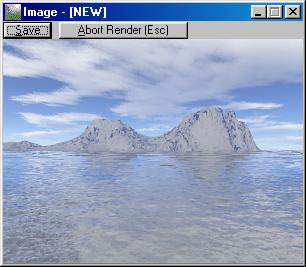 Click on open and browse to the Program Files\Terragen and you will see about 5 predefined surfaces. We chose the desert - sand and grass option. Please choose an option. Once you have gained some experience you can define your own surfaces. We suggest you experiment with there's first. There are also large numbers of surfaces to be found on the net. Please trawl though the Terragen forum pages where a large number of users have submitted there own favourite surfaces. This is a free resource. The next step is to define the camera position and the position we are viewing to. This is done from the Rendering dialog which we have described earlier.From the dialog above you can see that we have positioned the camera up the valley looking toward the dam wall and across a bit. We have set the detail to high and an image size of 1280 x 960. Clicking on the "Render Image" button and we create a scene as seen below, Please click on the image to see at full size. In this example the dam wall is not much more than a smudge in the distance. In this example we wish to view how the dam will look when there is some water in it. In Terragen click on the water dialog. The first thing is to set the water depth. 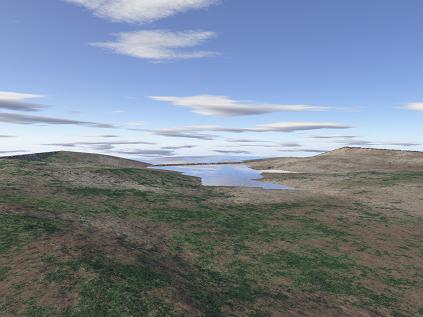 Terragen appears to represent the depth as a distance above the lowest point. I suggest that you enter different values; and click the update map to view in the landscape dialog. I believe we used a value of 14 in this example. As mentioned before you can see the water extending to the other side of the dam wall. To fudge an acceptable result I used Paint. The procedure to be applied is as follows. Open up the above render in Paint.From paint select the free form section. You draw around the section to be selected. Then copy this selection to the clipboard. Open up the original render with out any water and then press "Paste". You can then position the cut out piece. When it is in the correct position press the escape key and it is locked in. The final render is seen below. Click on the picture to view expanded version.